Click here to see the tutorial on “How to Make a Domino Book”. 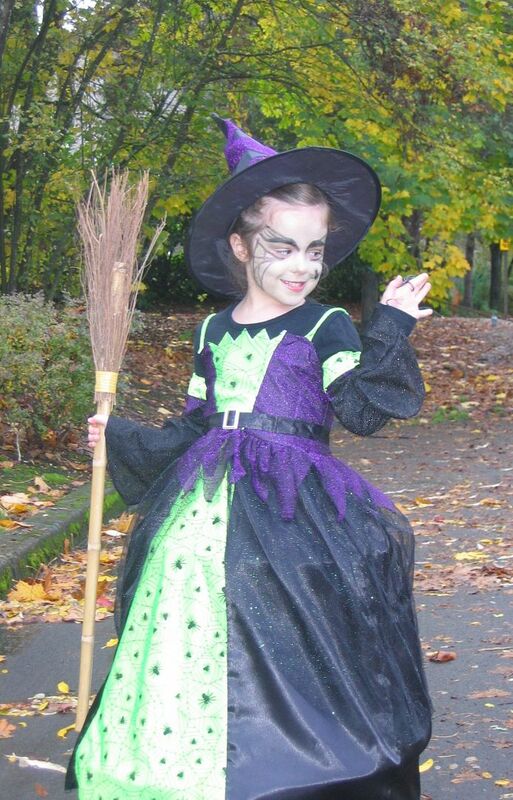 Whew, that’s it for Halloween! I wish everyone could have won. Even though I was giving away a lot of art (there were 48 winners) it was a huge drawing pool with 161 people in the drawing. I’ll post a recap of all the winners tomorrow. I already have addresses from most of the winners so feel free to email me yours if you haven’t already. The email button is in the upper right hand column of the blog. Those that didn’t win don’t worry as I give away art every month. 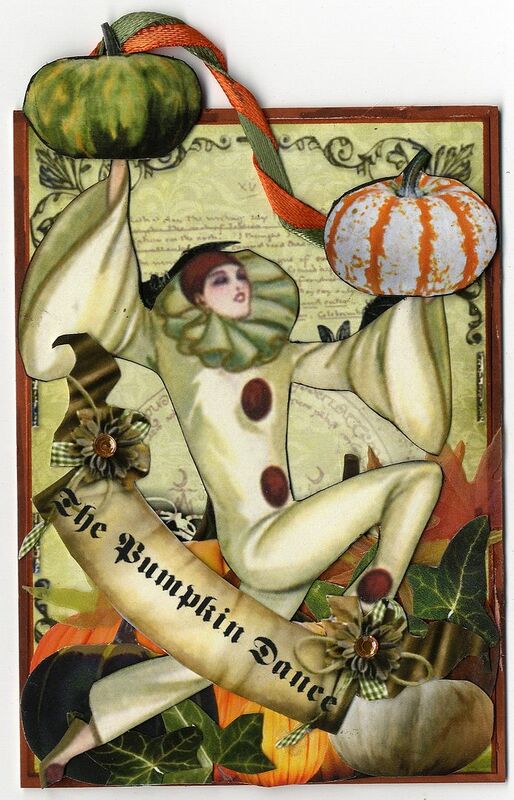 Have a fun, safe, and Happy Halloween!! 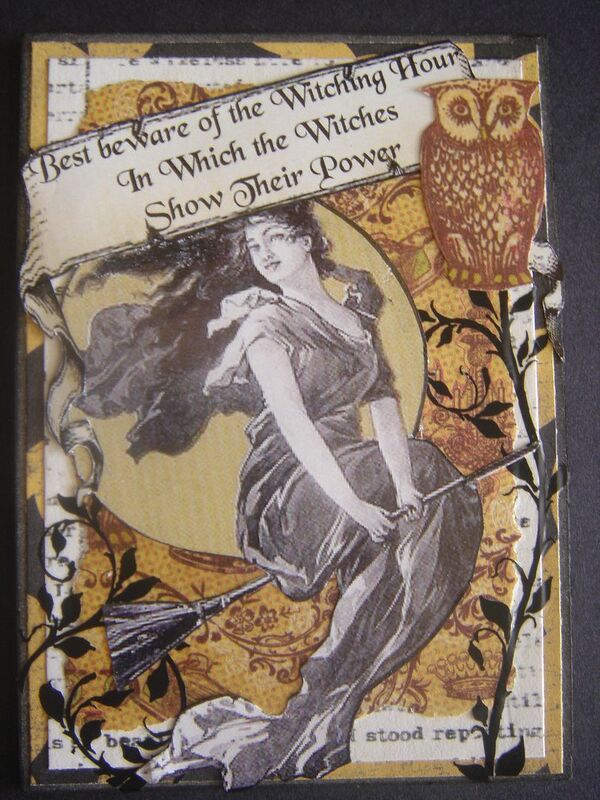 I decided to make an accordion fold book for my witch ATCs. These are the easiest books to make. I’ll post a tutorial for you next month. The overall size of the book is 3 ¾” x 5 ¼” x 1 ½”. 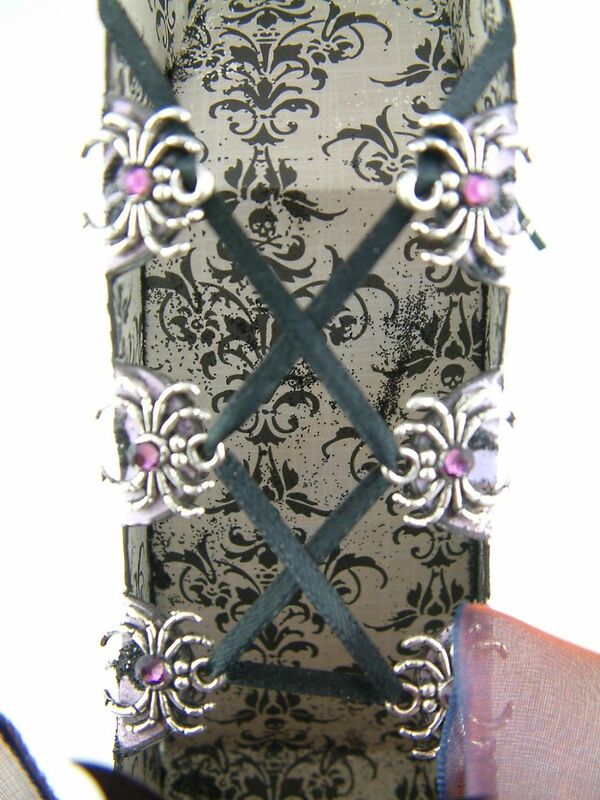 The spine is made of bookbinding tape that I’ve stenciled and embossed. 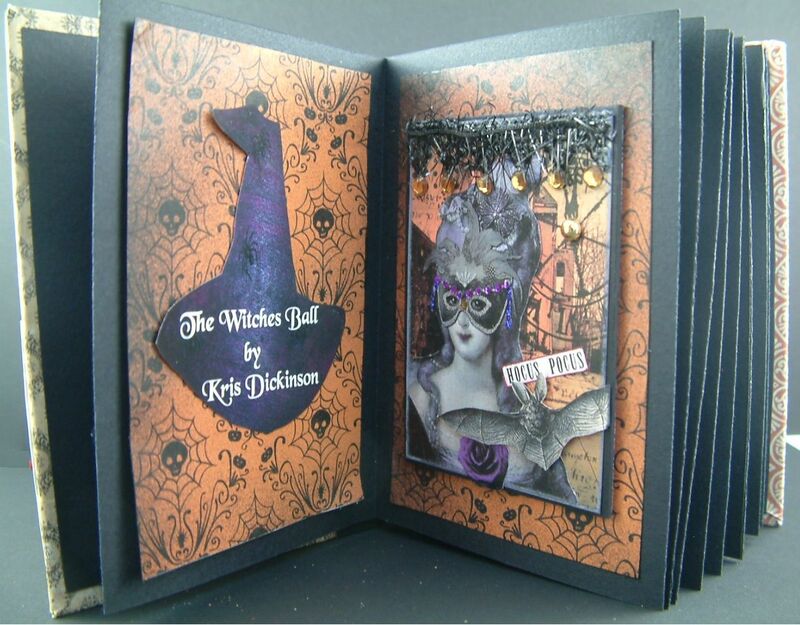 Inside the pages are made of black cardstock and the dimensions of each page are 3 ½” x 5”. This is the perfect size for ATCs; particularly ones that overflow the edges like mine do. 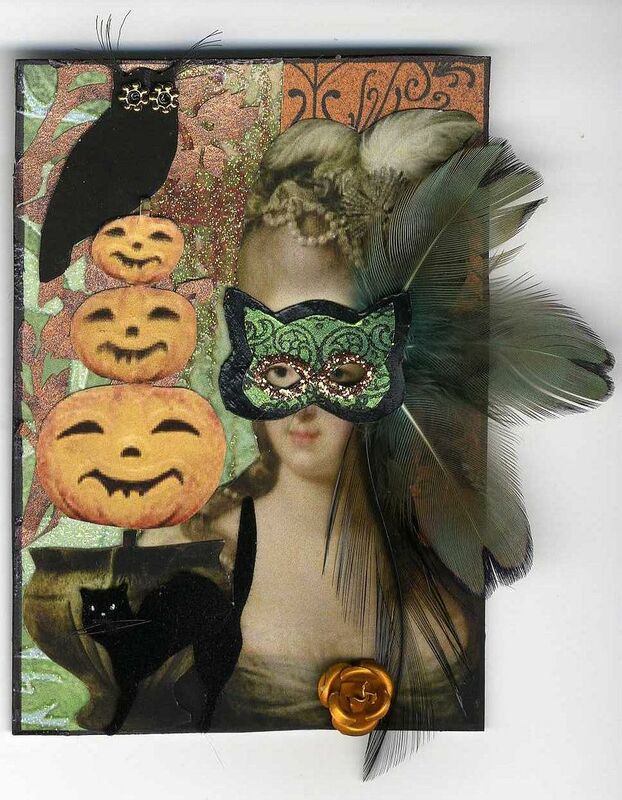 I added decorative paper to each page to coordinate with the ATC. 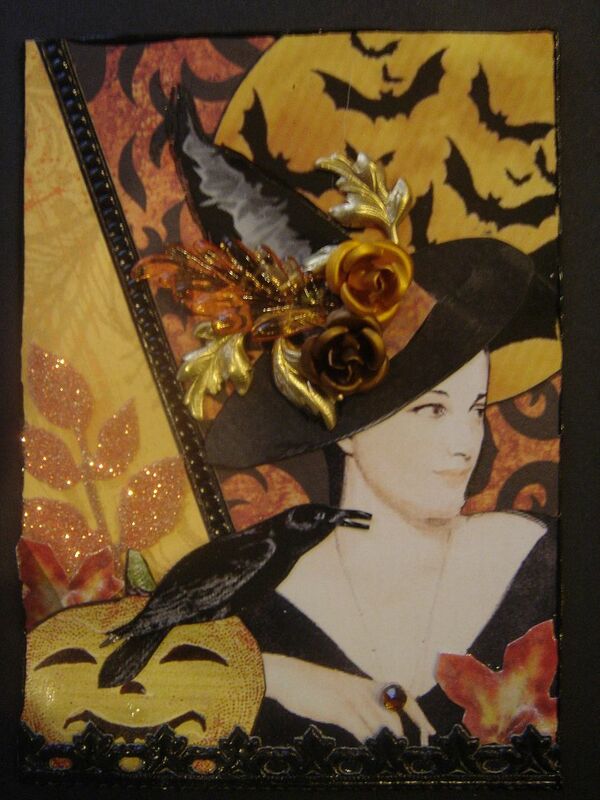 On the right side of the page I attach the ATC using glue dots. I use glue dots because they hold well and you can remove them without damaging the art. On the left side I have a witches hat with the title of the art and the artist name. 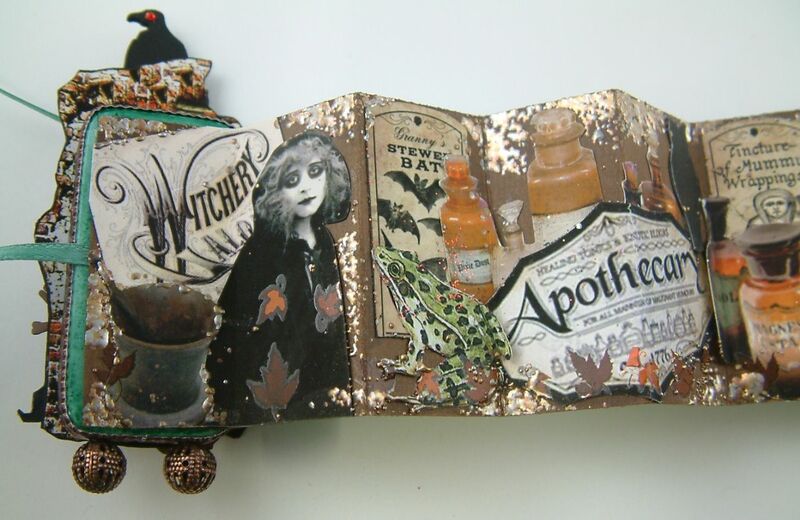 While I was making one of these for myself I made one for you (minus the ATCs). 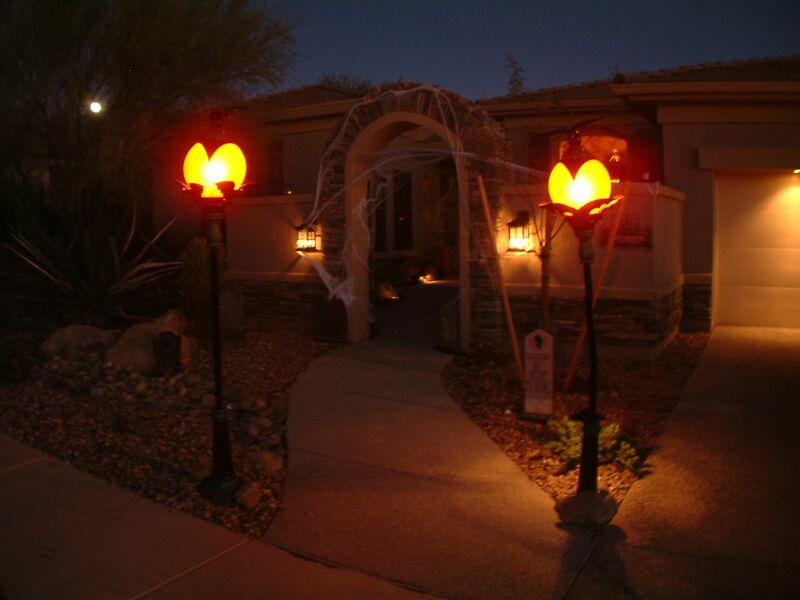 If you are stopping by visit the Halloween Party Blog Party just scroll down a little further and you will come to the party post. I used false eyelashes to create the tufts on the owls head. So ioin in and follow your artistic muse! Welcome to Artfully Musing. Feel free to park your brooms outside. 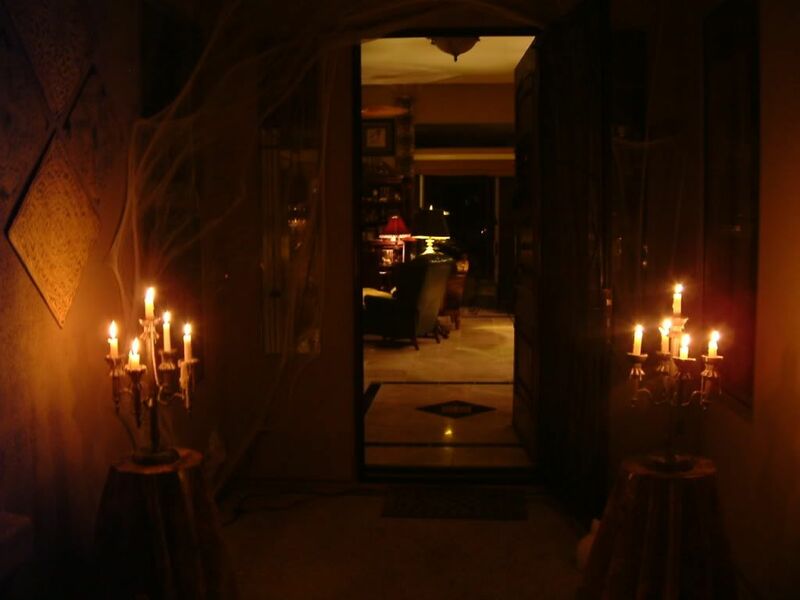 The candles are lit and the spider webs hung. 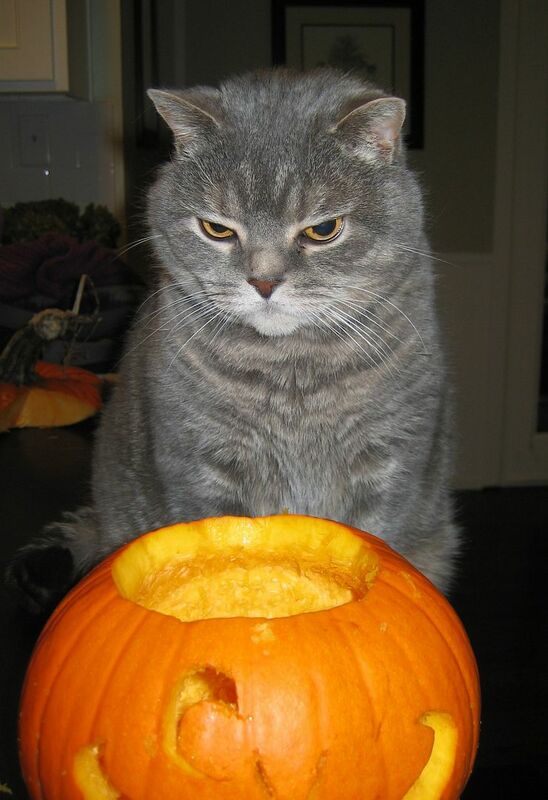 The cat is guarding the pumpkins. Owls are flying in from near and from far. 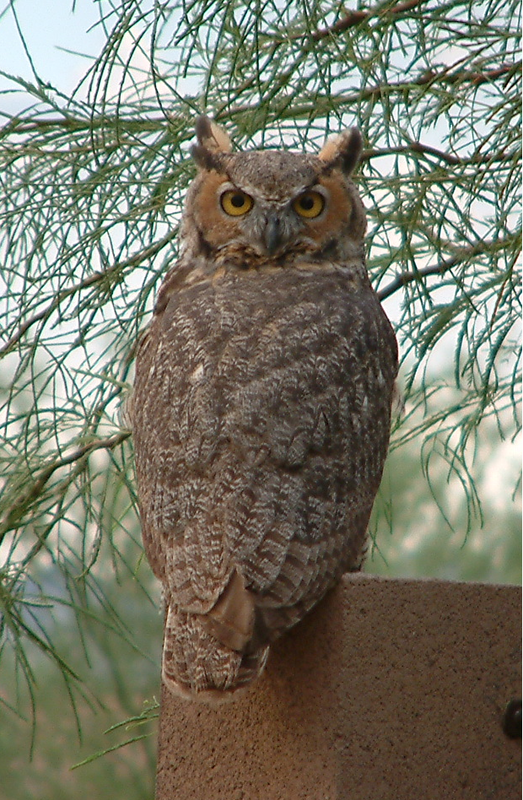 This guy (great horned owl) paid us a visit after a storm. It sat on our back fence for the longest time, drying its feathers. 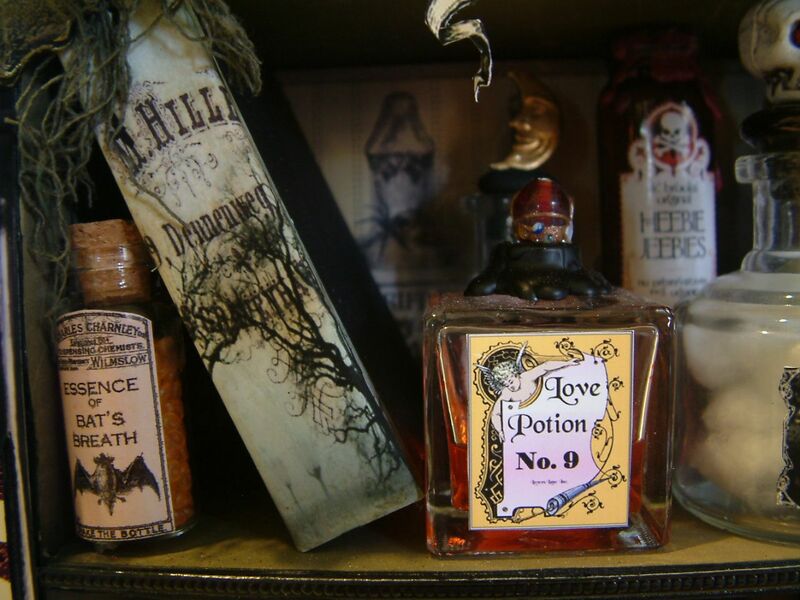 Perhaps you are in need of a potion or a spell. If you’re having fun, just continue down the blog. 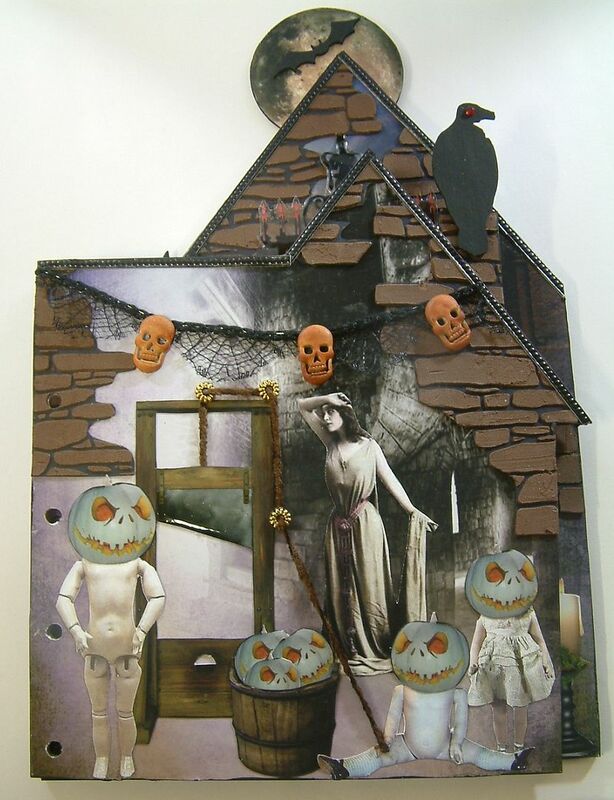 It’s all Halloween here all month long. 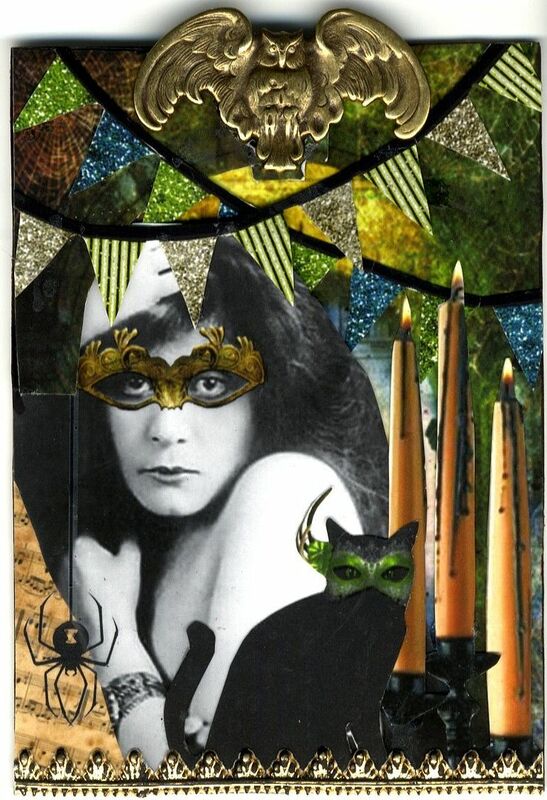 Lots of Halloween art and eye candy awaits you. 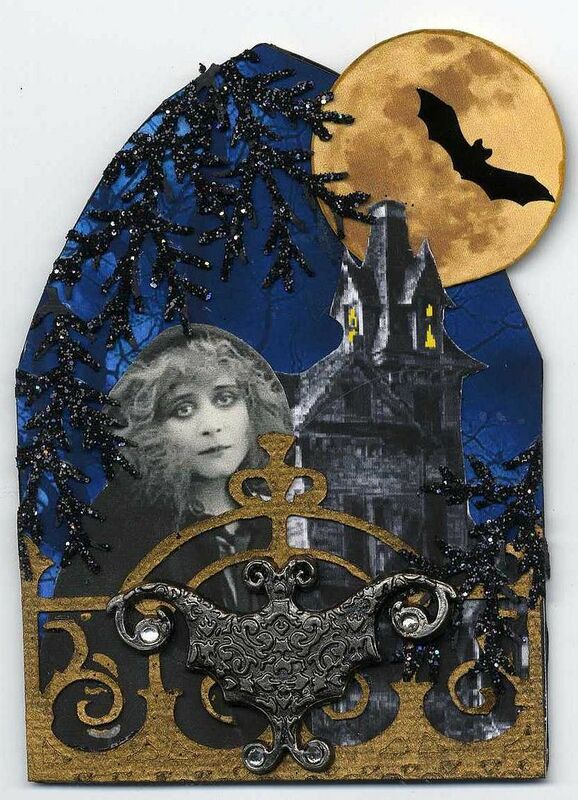 Or perhaps you would like to sign-up for my Halloween Giveaway (details at the top of the blog. 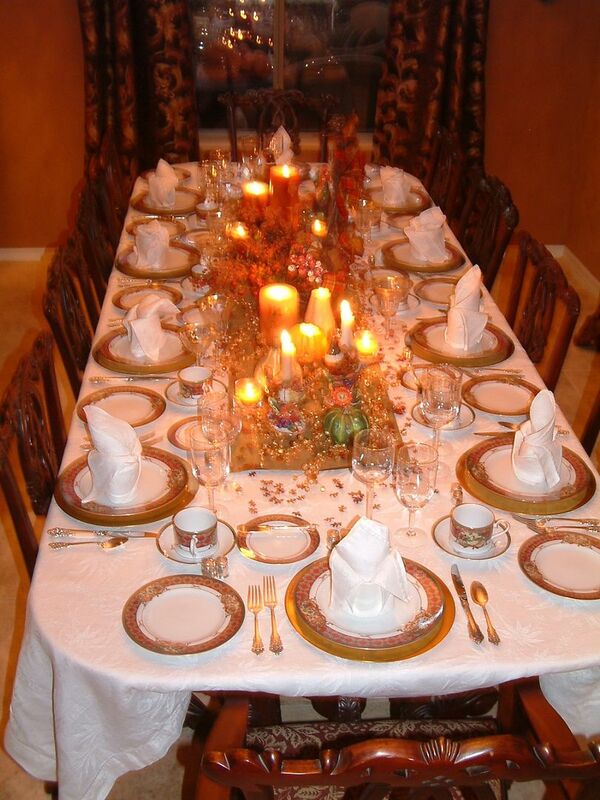 Click here to jump to A Fanciful Twist and to a list of other blogs participating in the party. 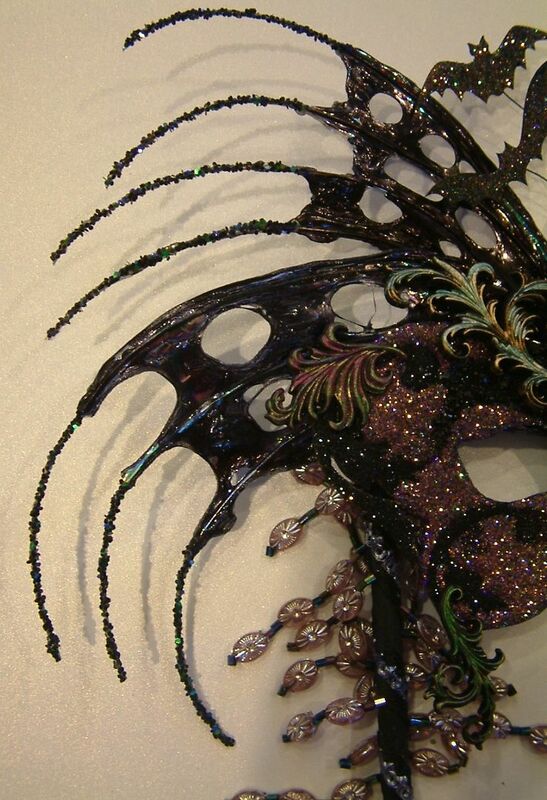 Well, a witch can’t go to the ball with just fancy shoes, she also needs a mask. If you missed the post on the shoes click here. 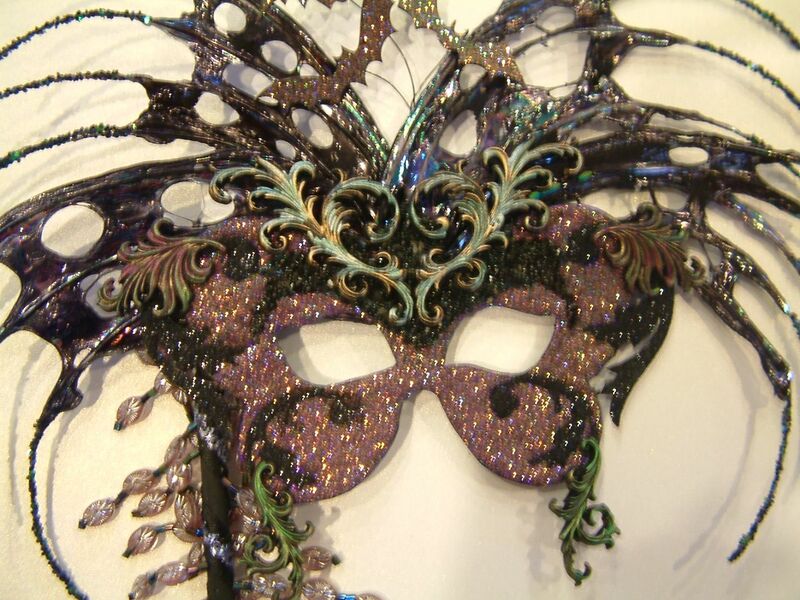 The base of the mask is made of layers of cardstock embellished with Glitter Art Institute’s glitter and Black Gala Glitz (shards of glass glitter and micro beads). I attached stamped flourishes from Alpha Stamps that have been painted with metallic paints and Ranger Alcohol inks. 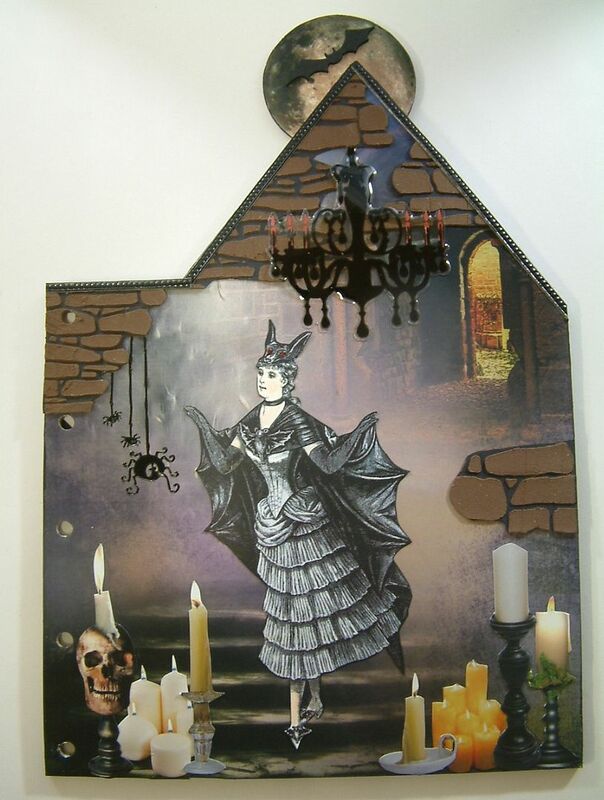 The bat wings are made from Fantasy Film and Fun Wire. Fantasy Film does not come in dark colors so I used blank Ranger Alcohol ink to darken the film. 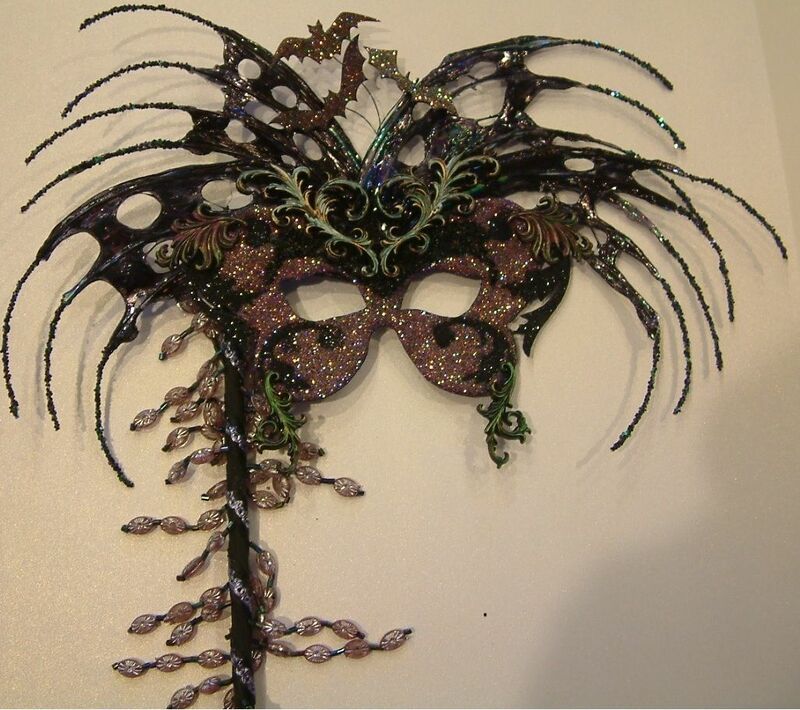 The wings are embellished with Glitter Art Institute’s Lavender Blue Gala Glitz (shards of glass glitter). The stick is made from a wooden dowel to which I attached beaded trim and German Scrap. The woman in the image is Clara Bow. I digitally added the spider tattoo and used a fine point pen to draw the gothic eyes. 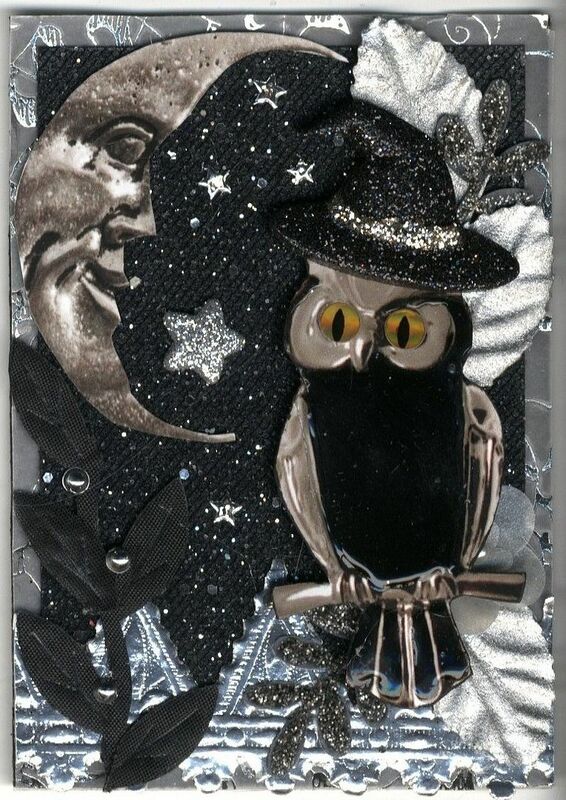 I used Ranger Alcohol ink to die the feathers green and the bats are sequins painted with metal paint with some glued to wires. 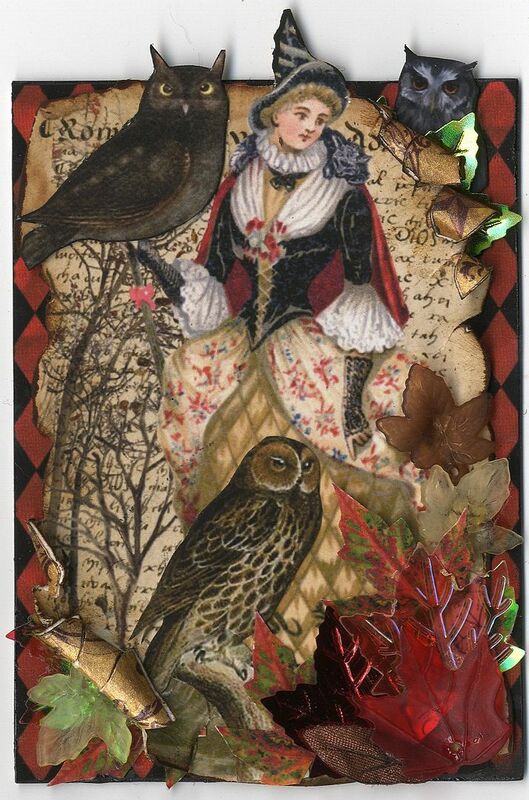 The background in this piece is fabric. The owl is an image of a piece of jewelry. I added depth to the owl by applying Glossy Accents. I like to challenge myself every once in a while, by limiting the color scheme to two colors. I’ve always wanted to make a paper shoe. The girls in the Marie Antoinette swap group have had shoe swaps from time to time but I’ve never been able to participate. 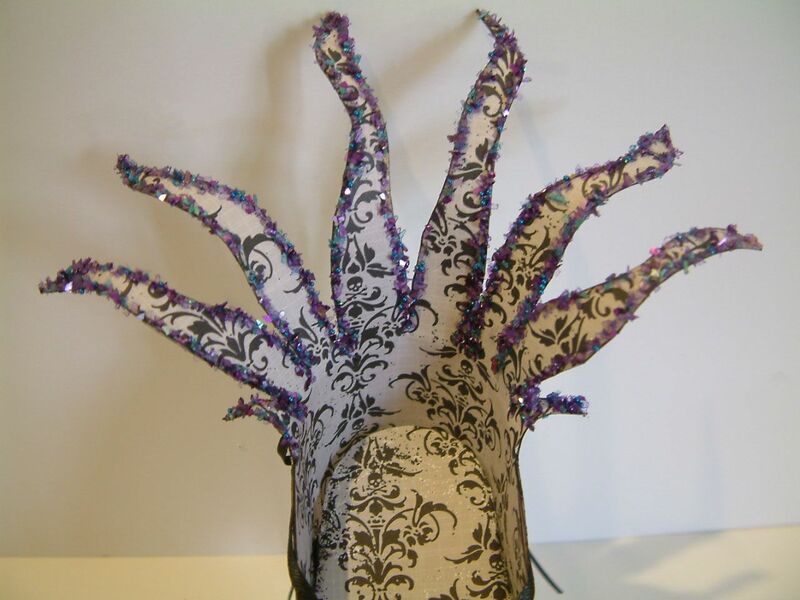 So I thought it would be fun to make a witches shoe fit for a witches ball. I used patterned paper outside and inside. I added glitter to the designs on the purple paper. 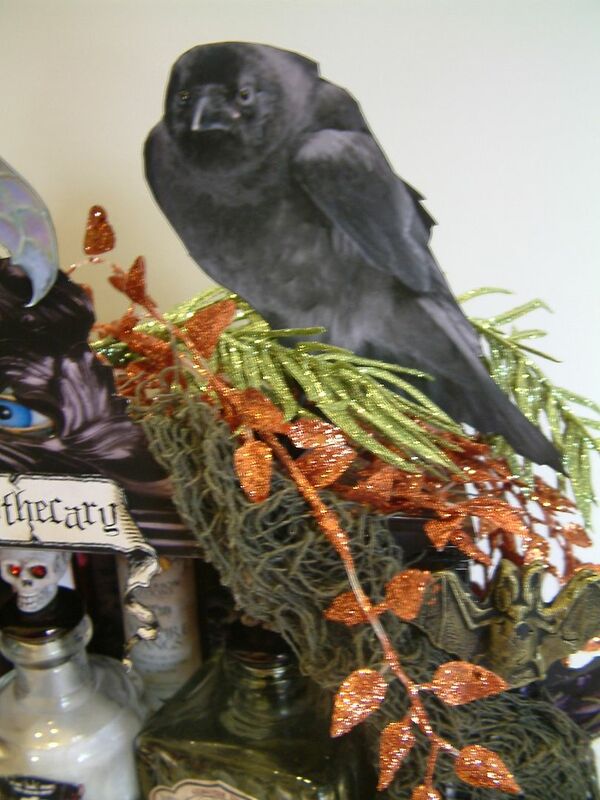 For the décor on the top of the shoe I used ribbons, a metal bat I painted silver, and chipboard bats that I attached with black wire. 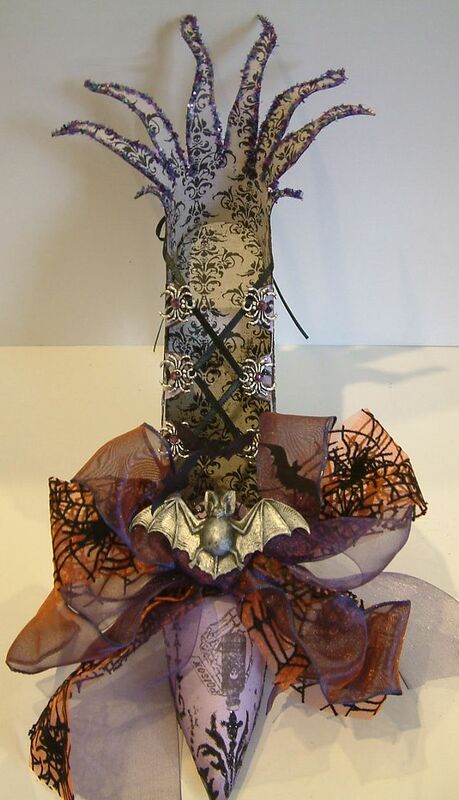 You can find the purple iridescent ribbon, orange and black spider web ribbon, metal bat, and chipboard bats at Alpha Stamps. 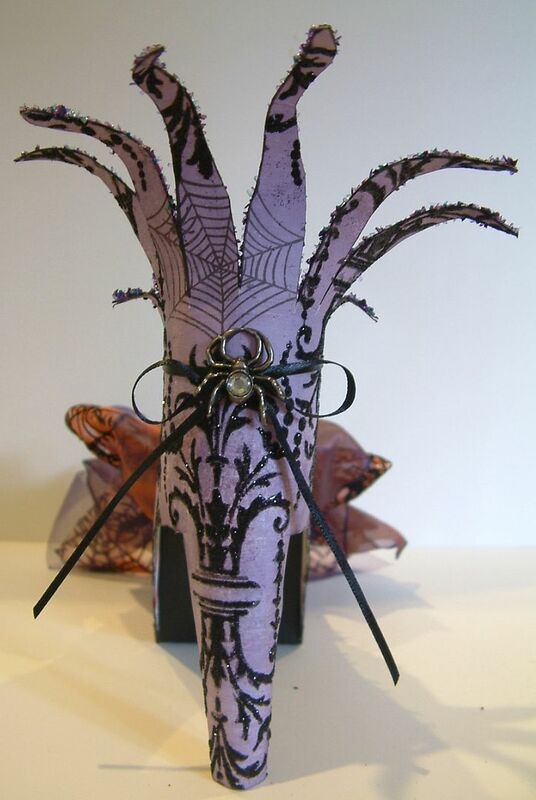 I used metal spiders accented with purple crystals and black ribbon to lace up the shoe. 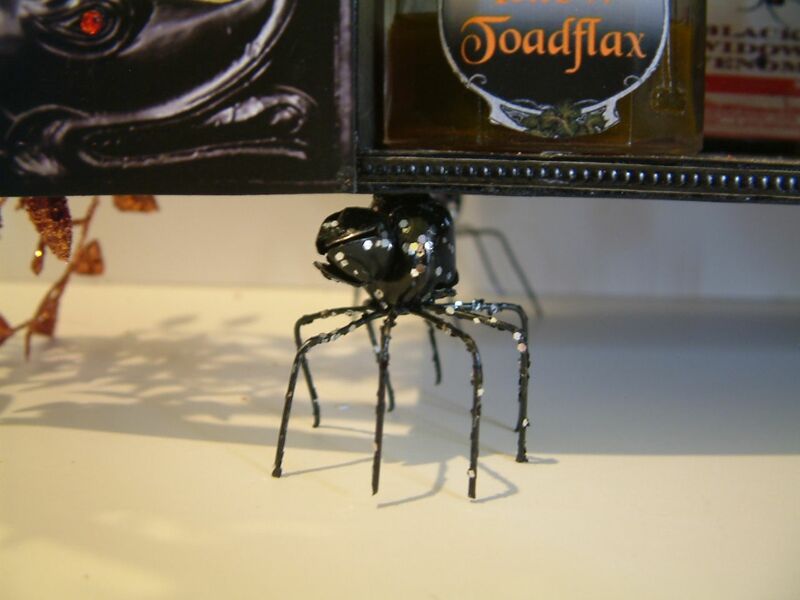 Alpha Stamps carries similar pewter spider charms and spider beads. 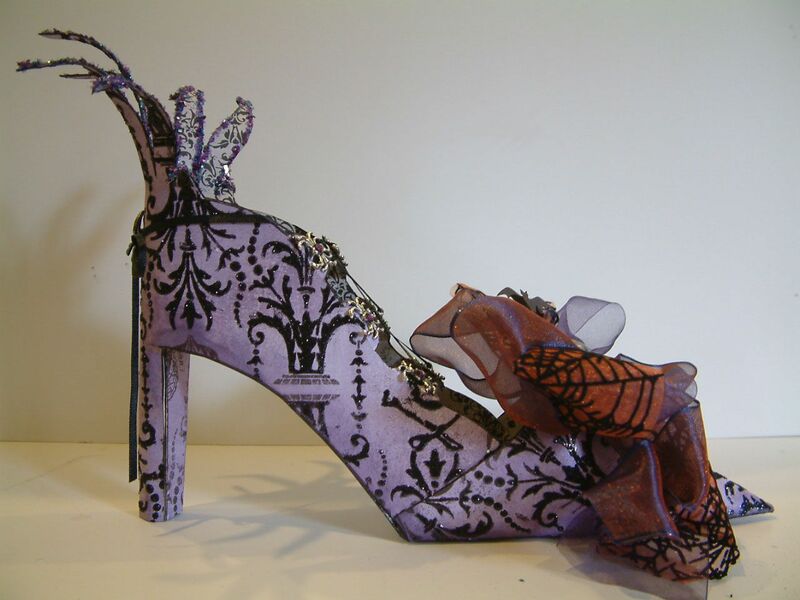 I edged the back of the shoe with Glitter Art Institute’s Lavender Blue Gala Glitz which is shards of glass glitter. I tied the laces in the back and added a spider. I had so much fun making this I’ll have to make more! 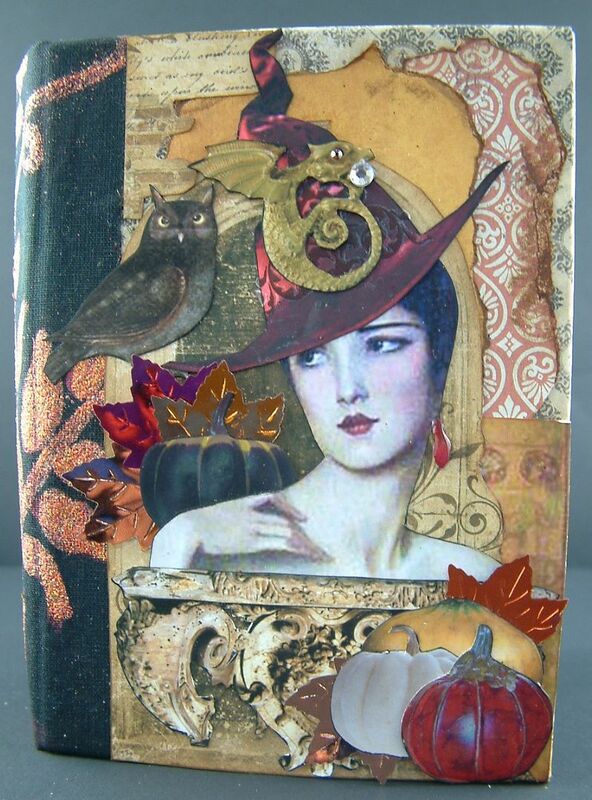 I created this book for an Alpha Stamps Yahoo group swap. The theme of the book swap is “Little Monsters”. The base of the book is four Masonite house shaped pages. I decorated the front and the backs of each page. The style is a little creeper than my usual Halloween work. 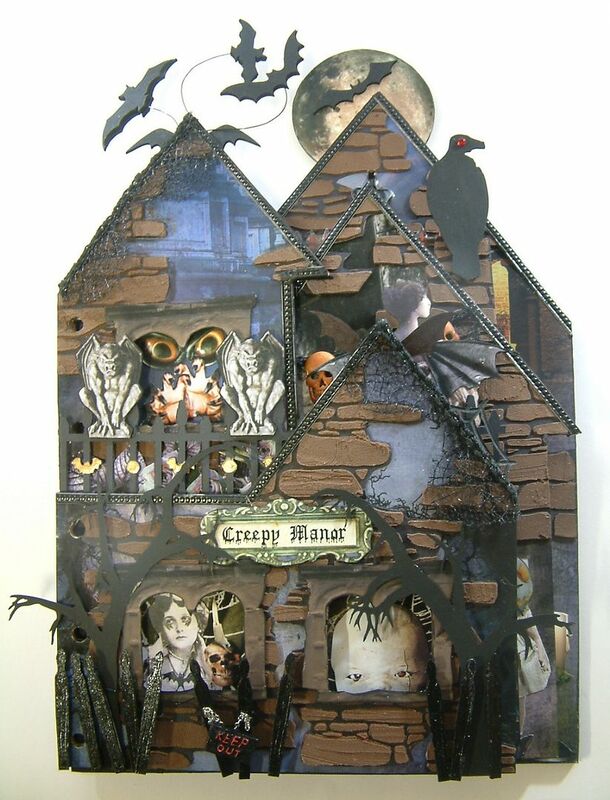 I just keep hearing the theme to the “Adams Family” in my head while working. 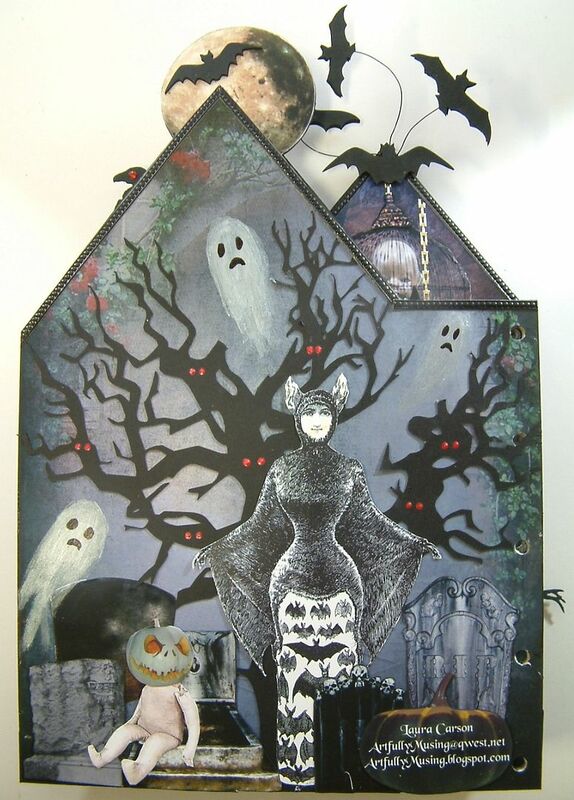 The spooky trees are Masonite that I painted black. You can purchase them at Alpha Stamps. I used a stencil and a product called “Texture Magic” to create the stone work. Using a stonework stencil, I chose to apply the product to a piece of black cardstock rather than directly to the house. Doing it this way meant that once dry I could cut the stonework into the shapes I wanted and glue it to the house. In a future month I’ll be posting a tutorial in the on how to work with Texture Magic. 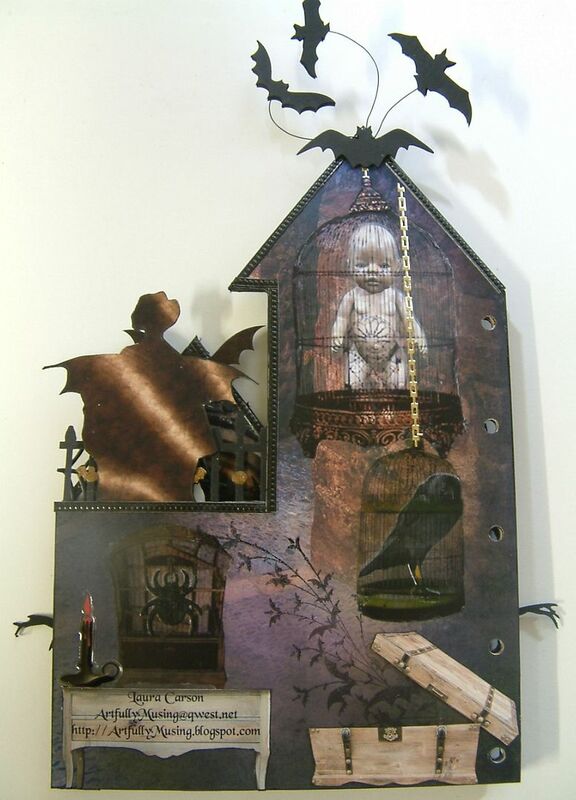 The doll, crow and spider are in cages that I are rub-ons that I made using Grafix Rub-Onz transfer film. Click here for the tutorial. The bats flying out of the box are stamped. I used Alpha Stamps collage sheets for all of the people/dolls you see on all of the pages. 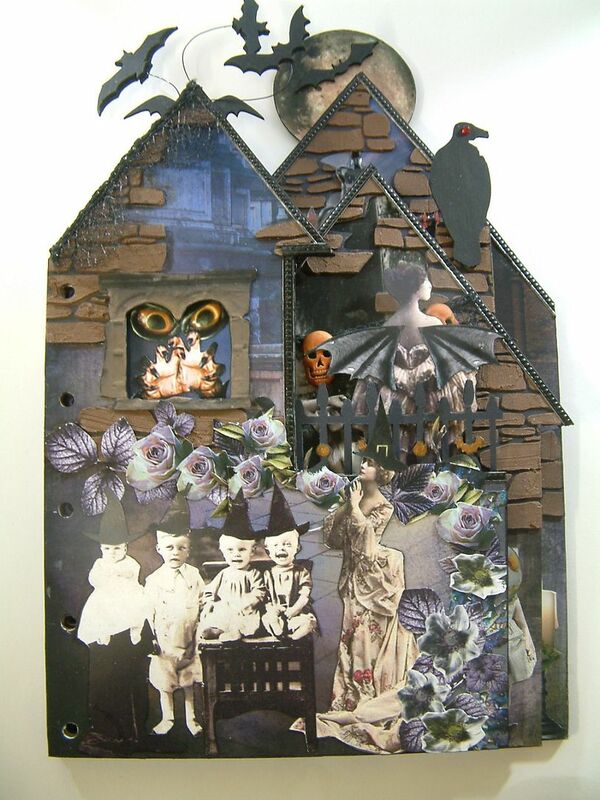 I used some of the doll heads for the back of this page which meant I had doll bodies with no head. So I decided to use pumpkins which then made me think of the guillotine. I used string and jewelry findings for the pull. I added Glossy Accents to the blade to give it a shine. 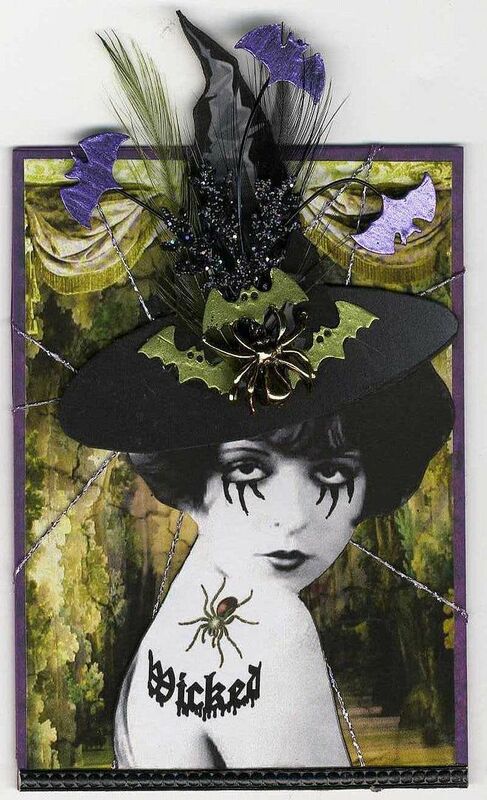 I’m imaging the woman is saying something like “Honey the kids are playing with the guillotine again!” I cut a wired ribbon of spider webs in half and along the design of the webs to create the garland. I thought of this page as the family tree. Here is where I used all of the doll heads. 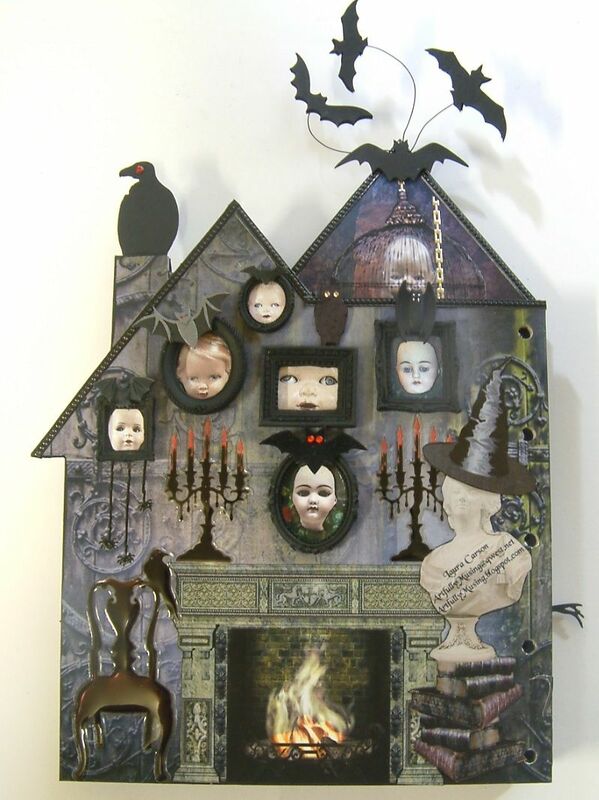 The miniature frames are Melissa Frances resin frames painted back. The chandelier is from a dimensional sticker sheet by Martha Stewart. The tree is cut from cardstock. I used red acrylic paint to add the eyes. 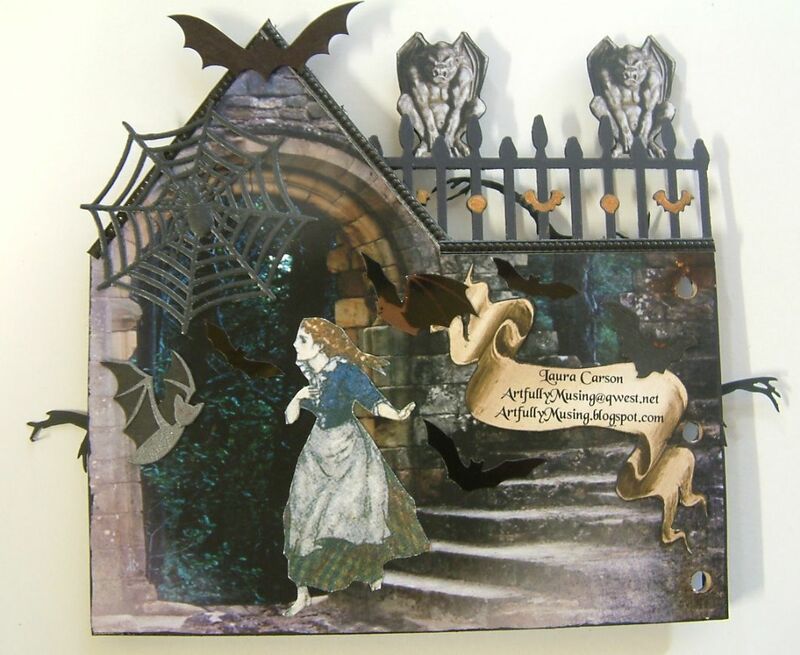 The ghosts are painted using Making Memories translucent glossy paint which gives them a shimmering look. I added the eyes and mount with a black marker. I punched the fence from black cardstock using a Martha Stewart punch that I think came out on the market last year. 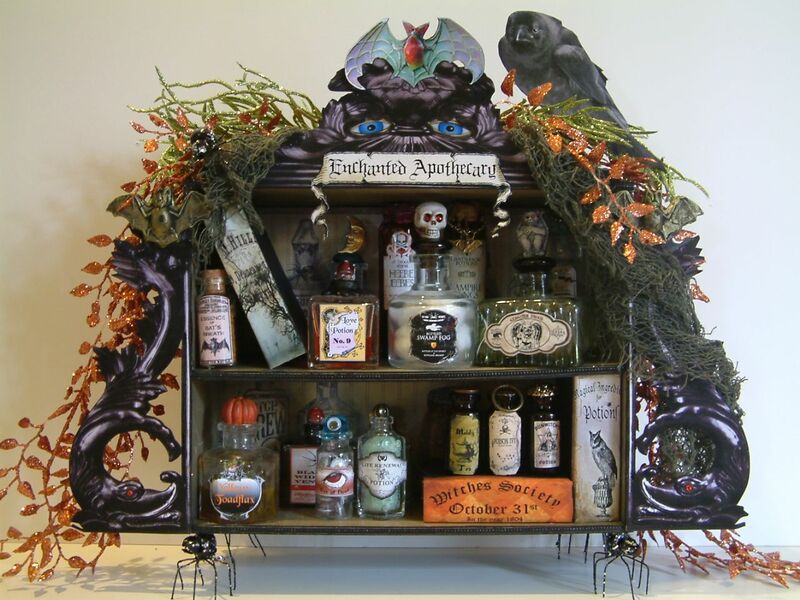 I’ve wanted to make a witches apothecary for awhile and I finally got busy and made one. The basic box is made from foam core which is covered with decorative paper. I covered the foam core before gluing it together (I used Ranger Glossy Accents). The overall dimension (including decorative elements) is 15” x 13 1/2”. The box inside dimension is 10” x 8 ½”. 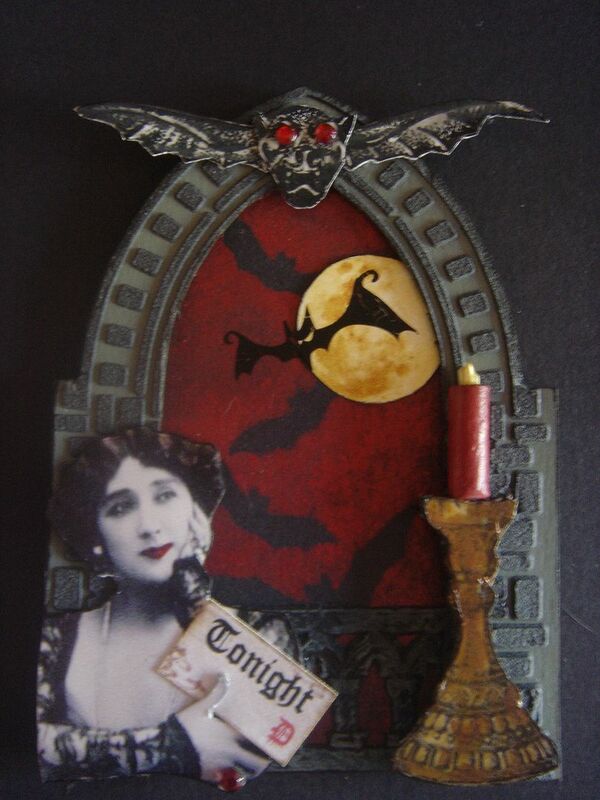 I framed the box using an image of a picture frame and added the eyes behind the holes and a bat to the front. The green bats on the sides are made of paper clay. The feet are metal spiders. 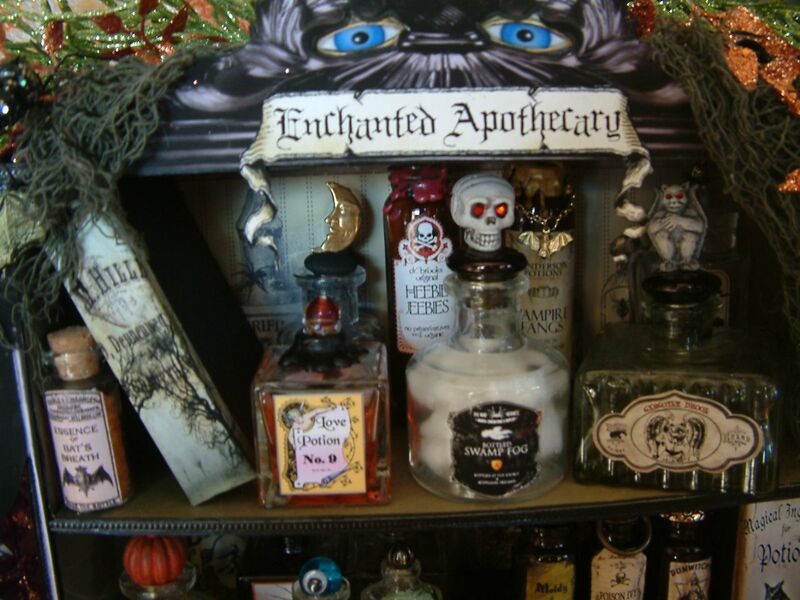 I used all kinds of bits and pieces for the stoppers of the bottles (buttons, skulls, wax, beads, marbles, drawer knobs etc.). The top on the Love Potion No. 9 bottle is a bead. The bottle behind it is a wooden drawer knob that I cut a grove into and inserted a metal moon. 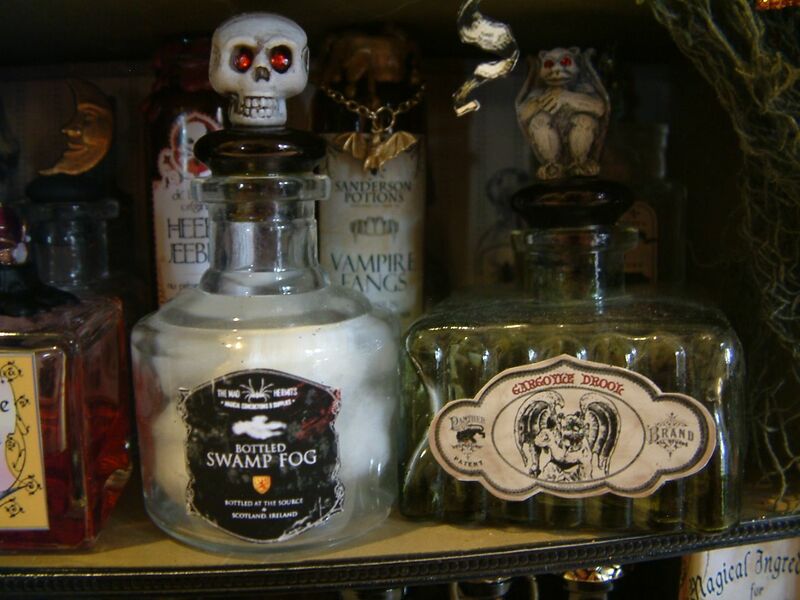 The Swap Fog bottle stopper is a ceramic drawer knob painted black with a scull bead glued to the top. I added red crystals to the eyes. You can purchase the skull beads at Alpha Stamps. 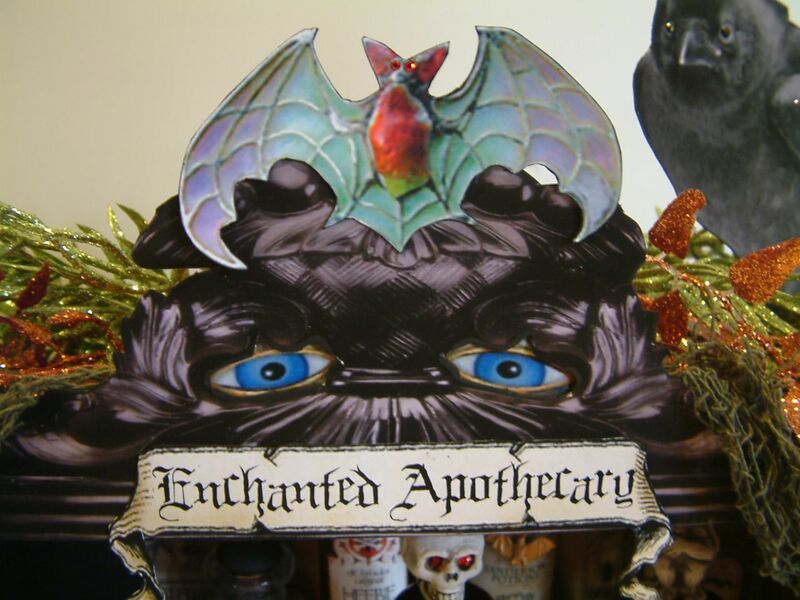 The Gargoyle Drool bottle stopper is also a ceramic drawer knob painted black and a ceramic gargoyle glued to the top. 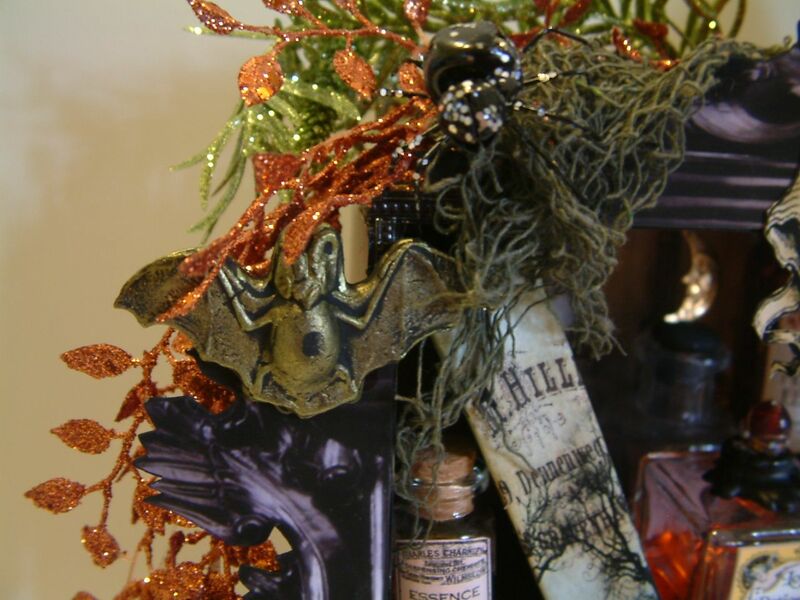 In the back is a Vampire Fangs bottle where I covered the opening with dripping wax and added a chain with the bat. 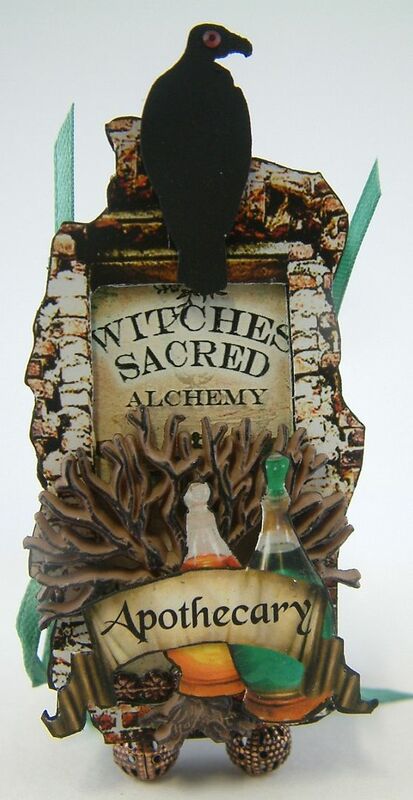 You can also purchase the bat charm at Alpha Stamps and some of the bottles I used. 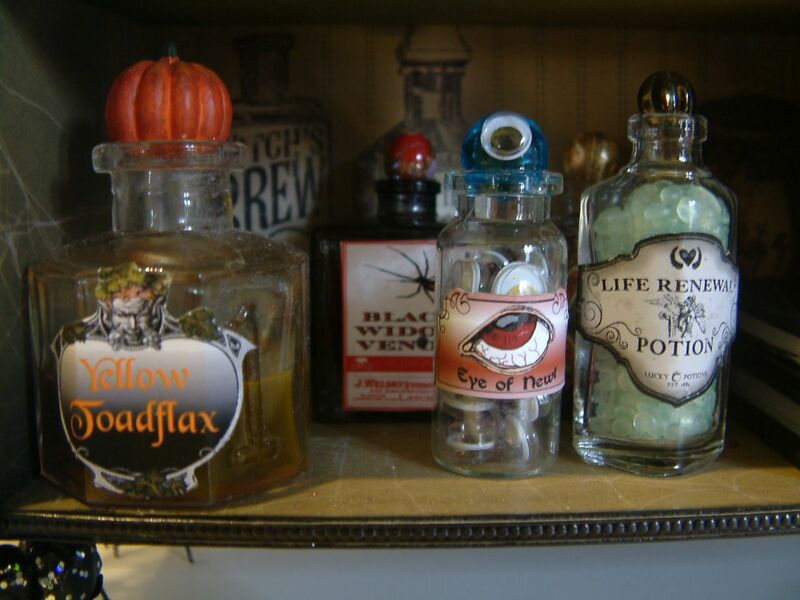 I used a pumpkin as the lid for the Yellow Toadflax and used a marble with an eye glued on for the Eye of Newt. The Black Widow Venom and Life Renewing potion stoppers are beads. 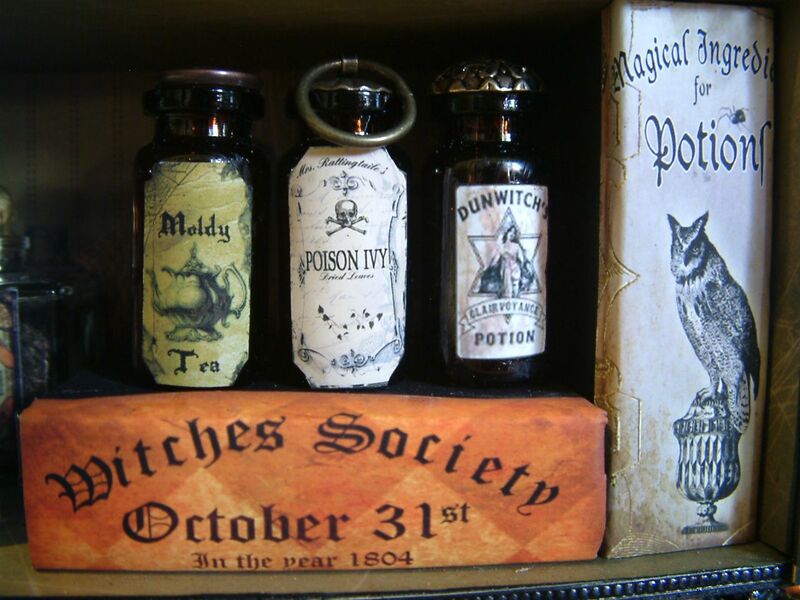 The Moldy Tea and Dunwitch Potions bottles are stoppered with a button and the Posion Ivy Bottle is stoppered with a metal drawer pull. 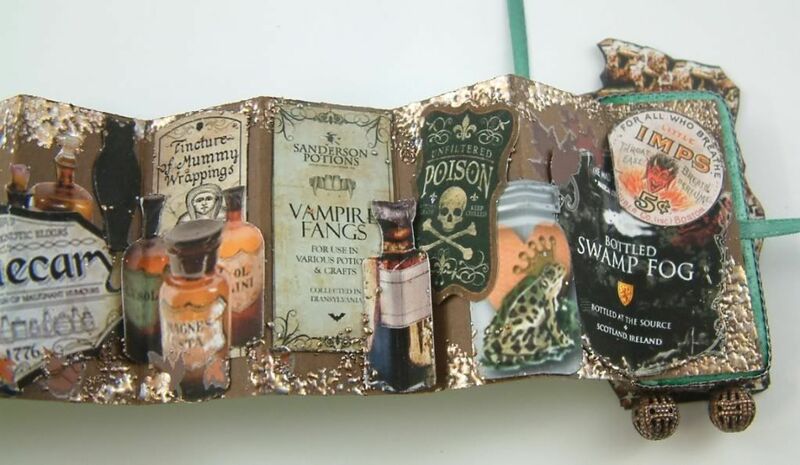 In addition to the potion bottles I also made some faux books. 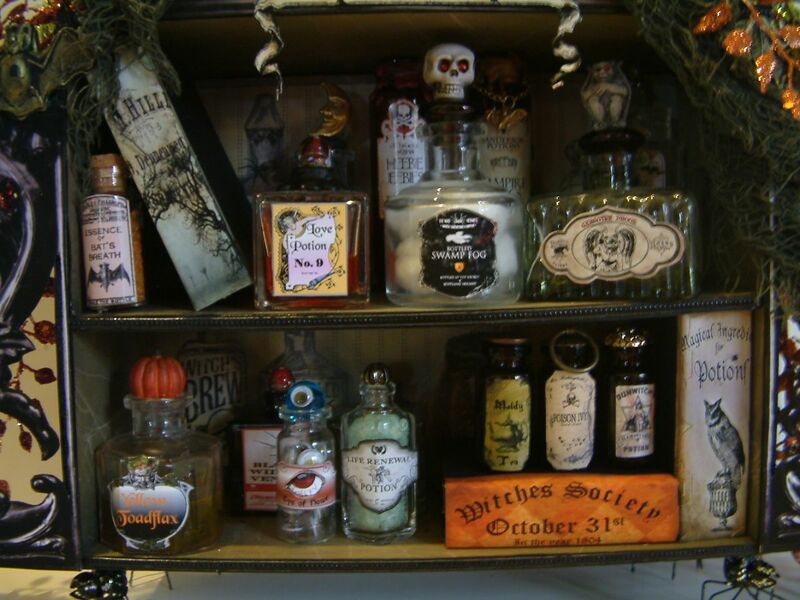 I filled the bottles with tea leaves, beads, paint, alcohol ink (diluted with rubbing alcohol), and cotton. 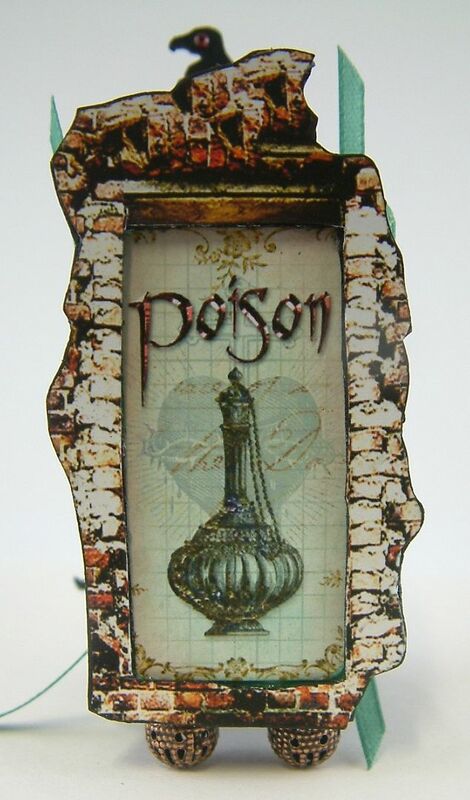 One great place to find potion labels is Altered Artifacts.